There are many online resources that make saving money easier. Here is a list of useful websites and apps that help you with different aspects of personal finances. These online resources are simple to use and offer tremendous savings opportunities. 1. Personal Capital — Personal Capital allows users to include all accounts in one location and provides a summary of spending, net worth, and investment portfolio. The program helps you understand and assess your net worth and build a customized retirement plan. 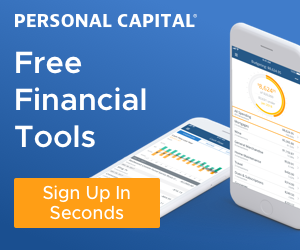 Sign up for Personal Capital for free HERE. 2. Digit — Digit connects checking account to analyze income and spending. It transfers a small amount of money from checking account to Digit savings every 2-3 days.Sign up for Digit HERE. 3. Acorns — An app that helps to make investments, even for just a few dollars. It rounds up all of the purchases to the nearest dollar, and invest that difference into a diversified stock. Sign up for Acorns HERE. 4. Robinhood — Robinhood app allows users to buy and sell stocks without paying a brokerage fee. There is no minimum deposit requirement or maintenance fee. Besides, you get a free stock when open a new account. Sign up for Robinhood HERE. 5. Mint — Mints allows users to track spending by category. Users can put bank accounts, credit cards, bills and investments in the app and have a comprehensive understanding of their personal finances. Sign up for Mint HERE. 6. LearnVest — LearnVest lets people track their spending, budgets and financial goals and shows spending trends over time. You get a customizable financial plan that helps balance your wants and needs. Besides, there are various online classes and tools to help you manage your personal finance. Sign up for Learnvest HERE and get started for free. 7. Goodbudget — It uses envelope budget system. Using virtual envelope for budget category (e.g., groceries, transportation), users can track envelope balance and their bank balance.Sign up for Goodbudget HERE. 8. YNAB (You Need a Budget) — An online tool that creates a budget based on the income already earned and generates reports and graphs to show where the money goes.Sign up for YNAB HERE. 9. Wallaby —An app that keeps track of credit card spending and makes recommendations on which credit card to use for a purchase to get more reward points. Sign up for Wallaby HERE. 10. FeeX — FeeX tracks fees of users’ retirement account and makes suggestions on cutting the cost of fees.Sign up for Feex HERE. 11. Tip Yourself —It is an app that allows users to transfer small dollar amounts from their checking accounts. The goal is to build good money-saving habits. Sign up for Tip Yourself HERE. 12. Ebates — It pays members cash back every time you shop online through participating retailers (e.g, Amazon, Best Buy, GNC, Sephora–a long list of retailers). Sign up for Ebates using this link now to receive $10 bonus when you spend $25 online. 13. TopCashback — It is an app that offers cash back for online shopping from well-known stores such as Amazon, Gap, Macys, Home Depot, and many more. I joined both Ebates and TopCashback so I can compare deals and choose the best one for each online shopping. Sign up for TopCashback. It’s completely free to join. 14. Ibotta — It is an app that offers cash back for shopping for items in the product gallery from participating stores. Sign up for Ibotta now (it’s completely FREE) and you will get $10 welcome bonus–For a Limited Time! 15. SavingStar — It is an app that allows users to earn cash back through using their digital coupons. 16. Shopkick — It is an app that people can use to browse products, find deals and get points for gift cards. 17. Checkout 51 — It is an app that allows users to redeem their offers and get cash back for qualified purchases. 18. Paribus — It is an app that helps you get money back on online shopping when prices drop at a listed popular merchants such as Walmart and Costco. One can connect it with email so the app can scan the inbox for receipts from retailers. It can file a digital claim for you if the price drops and help you get the refund.Sign up for Paribus, 100% Free HERE. 19. ShopSavvy — It is an app that allows users to scan item barcodes at retail to find the best deal at local and online stores. 20. CamelCamelCamel — It is a price tracker that get discounts and track prices on Amazon products. 21. BuyVia — BuyVia is an app that offers price comparisons and shows sales by product category. 22. GoodRx — GoodRx compares prescription prices at pharmacies near you, including coupon information. 23. Honey — Honey is free browser extension that can automatically find and applies coupon codes at checkout for over 30,000 online retailers. It helps you save time and money! Get Honey, 100% Free HERE. 24. Coupons— Coupons offers online and printable coupons, discount codes from their website or app. Find Coupons from coupons.com. 25. Flipp— Flipp provides a collection of store flyers as a showcase of all the sales. When using the app, tap the product and it’ll drop it into your “clipped” area to create a shopping list. 26. Retale — It is an app that brings users hundreds of store ads, deals, and coupons into smartphones. 27. RetailMeNot — It is an app that offers bargains from thousands of stores and restaurants. 28. Shopular — It is an app that lists weekly deals and promotion codes from major retailers such as Target and Walmart. 29. Coupon Mom — Couponmom is one of the best coupon blog sites, with many printable and online coupons by store, brand and item category. 30. Money Saving Mom — Money Saving Mom is another great coupon blog site that provides numerous coupons, deals, freebies and money management tips. 31. $5 Meal Plan —It is a website that provides recipes for family meals that cost $5 or less. 32. The Dinner Daily —The Dinner Daily makes weekly dinner plans and shopping list based on store specials. They provide a free 2-week trial to everyone that signs up. 33. Paprika — It is an app that helps to make meal plans and grocery list. 34. eMeals — eMeals selects recipes from a variety of choices and generate shopping list accordingly. 35. Groupon — It delivers deals and coupons in local areas, such as restaurants and fitness centers. 36. LivingSocial — It provides users access to local deals on hotels, restaurants, and other places. 37. Local Flavor — It delivers various savings on dining at local restaurants, spars, fun, home improvement, and more. 38. Certifikid — It provides family-focused deals in Washington DC areas, Dallas, and some other big cities. They offer many deals on local summer camps, kid activities, sports events, etc. 39. Uber — An app that helps find a ride at lower costs. 40. Lyft — An app that helps users get an affordable ride whenever they need one. 41. GasBuddy — It is an app/website that allows you to find cheap gas in an area based on location or zip code. 42. HotelTonight — HotelTonight helps find low prices on last-minute hotel bookings. 43. Couchsurfing — It helps saving money by searching for somebody’s couch for a night’s sleep. 44. Airbnb — It is an online service that helps users find affordable accommodations by booking a bed-and-breakfast at a cheaper price. 45. Priceline — It allows users to name their own price for hotels, car rental, and flights to get a deep discount. 46. Hotwire — It is a discount travel site that offers low prices for hotels, cars, and flights. It does not offer price bidding. 47. Expedia — It is another travel website that offers deals on flights, hotels, and car rentals. 48. Kayak — It searches hundreds of travel sites to find the information users needed to make decisions on flights, hotels, and rental cars. 49. BestParking — An app that locates available parking spots in an area and allows users to compare prices and make a reservation. 50. ParkMe — An app that compares parking spots and allows users to reserve a spot in advance to save money. 51. Parker — An app that helps find available parking spots, prices and hours and provide GPS navigation to the nearest open spot. 52. SpotHero — An app that makes finding a parking spot easy and fast. It allows a reservation to save money. 53. Commutewise — A social network for carpooling for lowering travel spending and protecting the environment. 54. Zipcar — It allows car rental for a few hours, a day, or a week. It reduces the need for vehicle ownership and encourages a more shareable form of transportation. 55. Upromise — It is an online resource that offers cash back while doing online shopping and build a college fund. 56. Simpletuitions — A website that compares various student loans and saves money on college costs. 57. Fastweb — A website that helps find scholarships, financial aids, and student loans to cover some school costs. 58. Unigo — It provides searching for college scholarships and student loans. 59. Student Scholarship Search —This site provides information on a large number of awards, scholarships, grants and prizes. 60. RedShelf — A website that helps saving money on books, textbooks, and other digital content. Check out these online resources that help to improve your budget and saving money! Most of them are free or offer a free trial. What are the online resources or tools that you use for saving time and money? Feel free to share in the comments. Whoa! This is such a substantial list – and it’s SO helpful! So glad that you find it helpful! What a great list! I’ve been a long time Ebates member and love it! I love Ebates. So easy to get cash back. These all seem great. I love Ebates and Ibotta. There were some I haven’t even heard of that I need to check out! I learned about sites I never knew of, thanks! I’m looking into the $5 Dinners one. Awesome! I hope this long list is not too overwhelming. It is good to know those resources are available in case you need anything related. WOw! This is an incredible list. Thank you for taking the time and doing the research it took to pull this all together! So helpful. Thanks. Glad it is helpful! This list is amazing!! Wow! Super excited to look into this further. So much great stuff here! It was so nice of you to say so–making every minute I spent on it worthwhile. Thanks for the comment! These are great resources! I am pinning this so I can save it and really dive in. Awesome! Hope you find the resources helpful. Thanks for the comment. I will check it out.